This recipe is my entry for the event "Shhh!!! Cooking Secretly" challenge started by Priya Suresh. In this, I have joined with Lakshmi Vimala of Cooking Club and the ingredient given by her was Ragi and Jaggery. 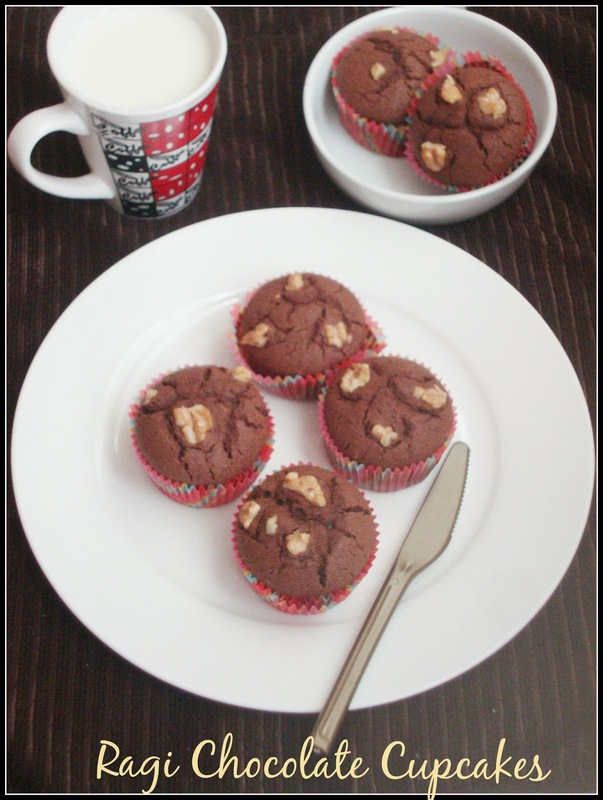 I have taken Ragi as the main ingredient and prepared cupcakes using this recipe from Priya's blog. I have just altered the sugar, milk quantity and added vanilla essence. 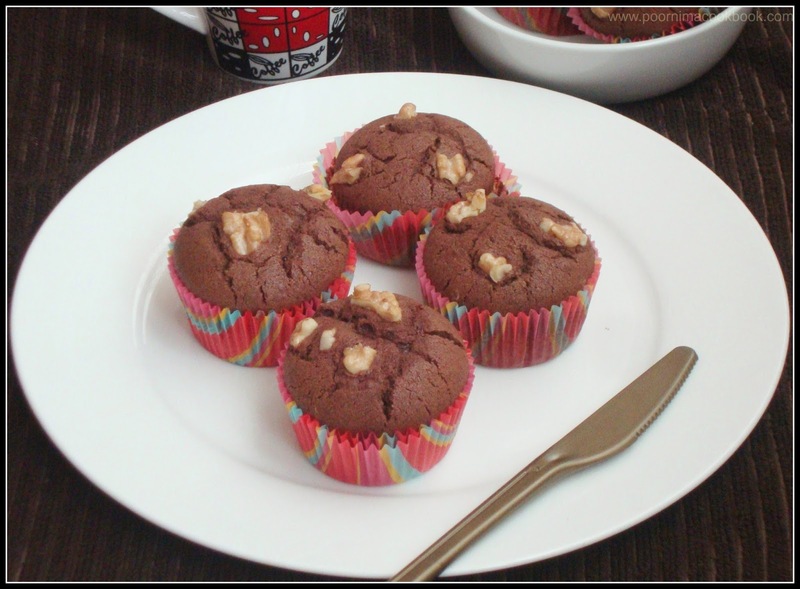 A special thanks to her for a wonderful recipe; my kids enjoyed eating this yummy cupcakes without knowing that I have added Ragi in it! Beat together butter, oil and sugar in a large bowl using an electric mixer on medium speed until creamy. Add the egg, milk and vanilla essence; beat until light & fluffy. Add the flours, baking powder, baking soda, salt and cocoa powder, stirring till it blends well. Stir in the chopped walnuts (reserve some for topping). Your tasty & calcium rich cupcakes are now ready to eat! Delicious cupcakes and they are healthy with the ragi in it, superb.. Thanks a lot for ur nice words Poornima, happy kids loved this cuppies.. Well done with your secret ingredients.. Delicious cake... Tasted the cake. couldn't make out that ragi is added. Thanks dear.. Healthy cup cakes, good one Poornima! 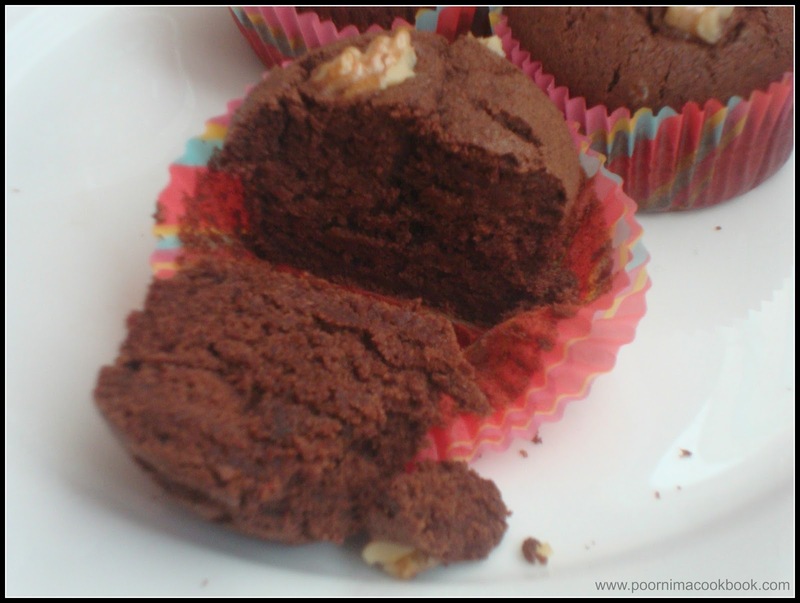 Cute & healthy chocolate cup cake . Very healthy n yummy cupcakes. Healthy tasty cupcakes. Wish i could get a share. G'day! Love how healthy these sound and your recipe!